A user who signed himself Corepixel has posted a Flickr slideshow of black and white photos of great motorcycles of the 1960s. I'm told that these photos were made by Corepixel's father between 1961 and 1965. 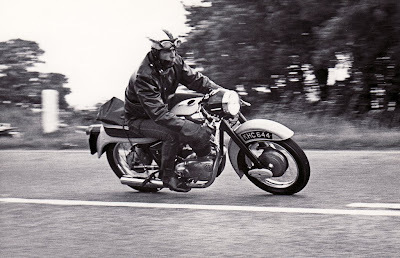 There are some great shots of Royal Enfield motorcycles mixed in here. The photo above seems to me to be a 1963 Royal Enfield Crusader Super 5, which would have the rare five-speed transmission. Corepixel says the pictures are not from a race but were made at a series of bends near Firle, East Sussex in the UK. Local bikers would go their to test their machines. Outstanding set of photos here. It's great to see some authentic action photos from the period. I like the new embedded Flickr slideshow too. Chris, thanks for pointing these out! The pictures are incredibly evocative.